Eggs Benedict is a classic, and the classics never go out of style. But a contemporary twist on the traditional works, too, which is what I’m doing today with my take on one of my favorite brunch items. A few things happen to land this dish here on Cooking & Eating the PK Way, which focuses on making good-for-you foods delicious while allowing for a goodly dose of indulgence now and again. Most importantly there’s nothing that’s not pleasurable about luscious hollandaise sauce, the key to eggs Benedict. Little more than egg yolks and butter, there’s a reason this dish should be consumed only in moderation given it’s high calorie and saturated fat content. 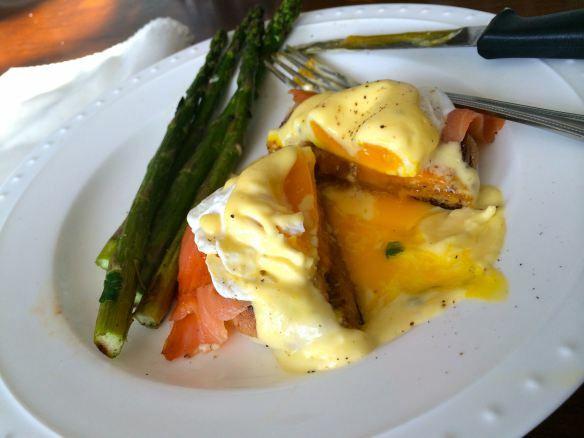 Hollandaise sauce is what we in nutrition call “energy dense,” meaning it packs a lot of calories into a small serving to the tune of about 70 calories per tablespoon. Eggs Benedict is thus definitely what I would call indulgent, which is why I’m blogging about it a few days before Easter when people have brunch and, well, eggs on their mind. (My recipe for deviled eggs has been wildly popular this week, for example.) So if you’re making Eggs Benedict the PK Way, you can bet there’s hollandaise sauce involved, and I’ll get to the recipe in just a moment. 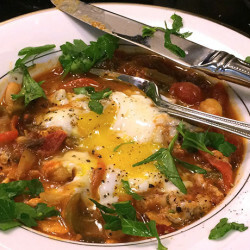 I make a few tweaks to the dish to bring in some better-for-you-but-delectable-too components. First, you’ll see that there’s a piece of smoked salmon on the plate that supplants the traditional ham. You’re gaining valuable heart- and brain-healthy omega-3 fatty acids with this swap, reducing your carbon footprint, and absolute yumminess; there’s a reason this variation is commonly found on restaurant menus. (You can read more about health and environmental issues regarding salmon here.) Second, I used a whole grain English muffin rather than refined white, which the body quickly breaks down into sugar and is less salubrious than breads that retain their fiber and nutrients. (Click here to learn the whole grain truth.) Third, I serve this dish with lemon-scented roasted asparagus, which brings some pretty green color and nutritious veggies onto the plate. Finally, I serve this dish with a smaller portion than you usually see. 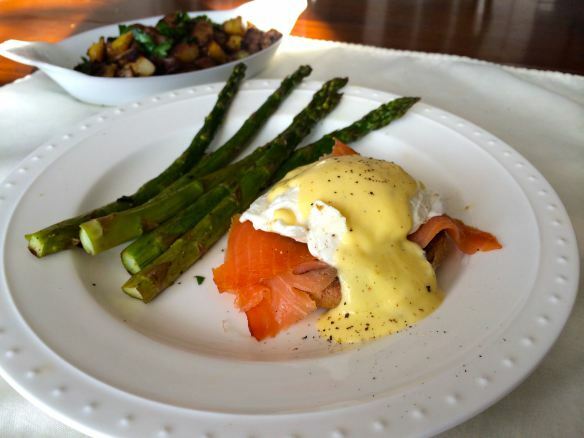 Eggs Benedict is quite rich and filling, and when served with asparagus and/or a few roasted potatoes on the side most people really don’t need two. I might use two eggs if I were eating this for dinner; anticipated consuming a very light supper following a big brunch; or had a long workout planned. It’s all about energy balance. Not to mention that learning to eat less, something the Japanese call Hara Hachi Bu and discussed in the context of my salad-eating ways here, is something that may prolong your life, a major research area in nutrition science. (Too early to have these answers but human trials are currently underway; a nice summary of the science is here.) Even if you’re not up for “eating until 80% full,” the fact is that most of us eat too much, in too large portions, so boosting a meal with the healthy stuff that helps you feel full, like the asparagus we do here, is a great way to reduce your calorie consumption. Making Hollandaise. Whisk yolks and water together for 1-2 minutes, until lighter in color. 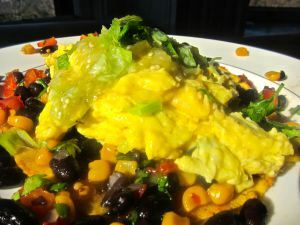 In a double boiler (or in a bowl atop a pot of simmering water where the bottom does not touch the water), continue whisking the egg yolk mixture several minutes, moving on and off the heat every 20 seconds or so to avoid cooking the eggs, 2-3 minutes total. Remove from the heat and add the butter, a few pieces at a time, whisking after each addition until incorporated. If you follow the melted butter option, stream the butter in very slowly to ensure a homogeneous mixture. Next whisk in the olive oil to combine and squeeze in the fresh lemon juice, adding more or less to taste. Mix in salt and peppers. Taste and reseason as desired. For a thinner sauce, add very hot water 1/2 teaspoon at a time until you reach the desired viscosity. This is also a good way to reheat the sauce right before serving; I found the addition of the water had very little effect on taste. Words of Caution & Putting it Together. Hollandaise is not difficult to make, but you do need to be careful you don’t scramble your eggs. It’s easier to avoid doing that if you whisk constantly and if you double this recipe, say, if you were making this for four people. More egg yolks means the heat is further dissipated throughout the mixture, reducing the possibility of making an all-yolk omelet. Oh, and poaching eggs is easy, too: heat about 2 inches of water in a sauce pan to a simmer with around 1 teaspoon of white vinegar; break each egg into a small soufffe cup or ramekin first then pour slowly into the simmering water; cook for about 6 minutes, until whites come together and yolks are still runny. 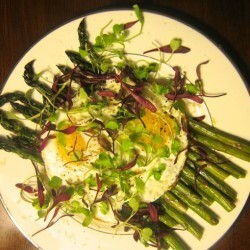 There are other methods to poach eggs, too, described here. You will see some solidification at the edges where the yolks have firmed but they do need to be runny to achieve the desired “Ooooh!” factor when taking your first bite. This is one delicious dish, so next time you’re up for treating yourself or others, check out this recipe. And just for the record, I absolutely wanted a second portion, just like any other person eating something delicious. But it wasn’t because I was hungry, or at all needed it. So I was glad to have made only enough hollandaise for two servings (me and my husband), plated just as you see it. I enjoyed every last bite of this fabulous dish, in moderation, without the guilt or weight gain that can happen from over-eating. Don’t forget that lemon-roasted asparagus is the perfect accompaniment and, if you’re really hungry or preparing this for a crowd, take it to the next level—calories be damned!—with sweet potato hash. And, of course a spicy Bloody Mary. After all, this is special-occasion fare. And it’s definitely what I’ll be eating and drinking tomorrow.